The Company You Keep: a review, or a deconstruction. | Over the line, Smokey! The Company You Keep: a review, or a deconstruction. 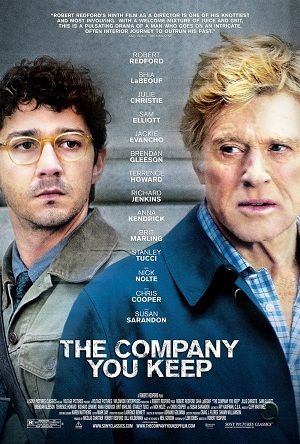 The film “The Company You Keep” was produced and directed by Robert Redford. One assumes he was inspired to do this project by the controversy surrounding William Ayers in the 2008 presidential campaign of Barack Obama. The film has received favorable reviews, which may fade in importance, given the recent events in Boston. (Ironically, Ayers 2001 memoir, “Fugitive Days”, was released the day before the September 11th attacks). Over the Line, Smokey! will not attempt a full review fo the film. Suffice to say this is an enjoyable page-turner-sort of film that attempts give a glimpse at the later lives and mentality of those who participated in the violent antiwar movement of the 60’s and 70’s in the US, under various names: Weather, Weatherman, Weatherwomen, and later the Weather Underground Organization. It is practically impossible for those who did not live through it, to understand the degree of division in the US during that period. The film fails in this respect; or rather, it doesn’t really try. Instead, it focuses on what amounts to the 2008 Bill Ayers talking points, with Redford trying to prove he didn’t kill anyone, that he wasn’t there that day. The title is part of the homily “You are known by the company you keep.” The implication being that Redford’s character/or perhaps Bill Ayers, was being judged by the company he kept. Fun, perhaps, but not heavy. Rather than attempting a “review”, OTL,S! has tried to deconstruct the characters in the film. In a national convention of the Students for a Democratic Society (“SDS”) in Chicago in the summer of 1969, delegates were given a manifesto written in part by Bernardine Dohrn, containing the line “You don’t need a Weatherman to know which way the wind blows”, from Bob Dylan’s “Subterranean Homesick Blues”). Dorhn led a breakaway faction called the Revolutionary Youth Movement, which in turn broke into factions, the most radical of which was Weatherman, which was founded at the University of Michigan in Ann Arbor. Their first demonstration was a riot in Chicago in October of 1969 to protest the trial of the Chicago Seven. By 1970 they had begun bombing government buildings including the Pentagon and the U.S. Capitol. They generally avoided injuries to persons by calling in warnings before bombs were detonated. The WUO comprised less than forty individuals, who went underground in 1970. A list of their actions/attacks can be found here. The stated goal of the WUO was the overthrow of the government of the United States, but their primary concern had always been the Vietnam War. The Weather, who were middle class, thought they would be able to mobilize students and blue collar workers, not realizing the conservative nature of both groups, not recognizing the folly of “taking war” to the police, and not understanding the folly of overtly taking the side of our enemy in war. It is fair to say they failed in most respects, and created a stereotype that still haunts left wing politics in the US. The war ended in 1973, and many of the legal cases against the Weathermen were dismissed on constitutional grounds. At that point, the Weather movement began to wane. Most of the Weathermen stayed underground for several years. Some joined other radical organizations including the May 19th Communist Organization and the Resistance Conspiracy. The film is an adaptation by Len Dobbs of the 2003 novel by the same name, written by Neil Gordon. One could, in turn, assume that Dobbs’ book was inspired by the publication of Bill Ayers autobiography, “Fugitive Days”, in 2001. OTL,S! has tried to deconstruct the principal characters as they related to the real history of the Weather movement. Robert Redford plays Jim Grant/Graves/Nick Sloan, a 1960’s radical who has assumed a new identity but is “outed” by a newspaper reporter in Albany, NY (which, not coincidentally, is the home of 3 real-life ex-Weather Underground members: Naomi Jaffe, Jeff Jones, and Eleanor Raskin). He then embarks on a perilous search for his former lover and co-radical, Mimi Lurie, who might be able to clear his name. The Sloan character represents (mostly) Bill Ayers, one of the founders of Weatherman, in Michigan and Chicago in the late 1960’s. Sloan is a widower. This may be a reference to the historical death of Ayer’s 1960s’ lover, Weatherman Diana Oughton (pictured above), in an inadvertent explosion in Greenwich Village. In the film, Sloan has an 11-year-old daughter named Isabel, delightfully played by Jackie Evancho. In real life, Ayers had two sons with Weatherman Bernardine Dohrn (also pictured above). Richard Jenkins plays the role of Jed Lewis, a University of Chicago professor. After resurfacing in 1980, Ayers took a masters degree in education from Columbia, and later became a University of Chicago distinguished professor of education. Charges against him had been dismissed because of prosecutorial/government misconduct. Chris Cooper plays Daniel Sloan, Nick’s brother, who lives in New York City. Ayers lived in NYC in the 70’s with Dohrn; and Bill Ayers does have a brother, John. Obviously, there were many radicals in NYC in that period, including Mark Rudd. Julie Christie plays Mimi Lurie, a character who represents an amalgam of at least three persons: Diana Oughton, Bernardine Dohrn and Kathy Boudin (also pictured above). In the film, Mimi Luri had participated in a Michigan bank robbery in which a guard was killed by another member of the group (now deceased). The Weatherman bombed several branches of the Bank of America, but never robbed a bank while Ayers, Oughton or Dorhn were members; nor did they kill anyone during that period (other than Oughten herself and two others, by accident; vide infra). 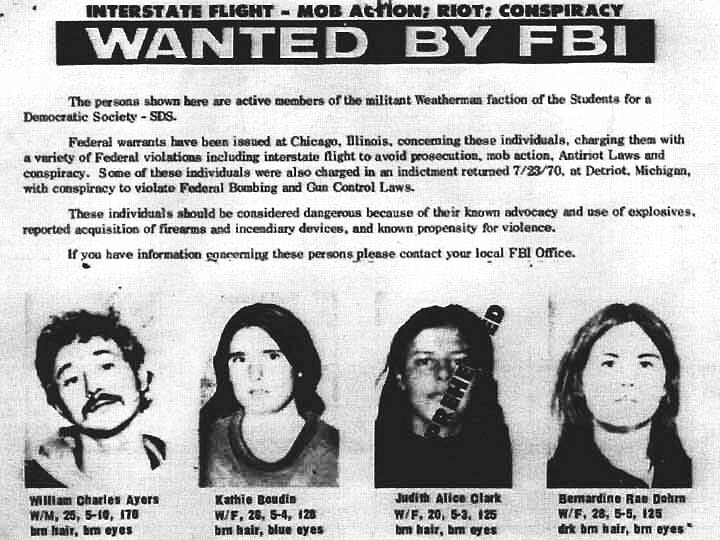 However, three former Weather Underground members, including Boudin, did, as members of the May 19th Communist Organization, aid the Black Liberation Army, in carrying out an attack on a Brinks truck in New York in 1981, when two policemen and a Brinks guard were killed. Diana Oughton’s life was loosely portrayed in the 1975 film “Katherine,” with Sissy Spacek in the title role. The daughter of a midwestern Republican family, she had been radicalized by experiences in Guatemala. She and Bill Ayers had met at the University of Michigan in 1966. She later became more radical, and the two drifted apart. In 1970 she was killed with two other Weathermen, in the accidental explosion of a bomb in a townhouse in Greenwich Village. This was the event which caused Ayers, Dohrn, and the others to go “underground,” thus becoming the Weather Underground Organization (“WUO”). Two Weatherwomen who survived the Greenwich explosion, Cathlyn Platt Wilkerson and Kathy Boudin (the second inspiration for Mimi Lurie), also went underground. Wilkerson surrendered in 1980. Boudin served 22 years in prison for her role in the Brinks robbery. The father of the child, David Gilbert, was also involved in the Brinks holdup and received, in essence, a life sentence. Ayers and Bernardine Dohrn (by that time out of hiding and also out of legal jeopardy) became the guardian of Boudin’s small son Chesa. This event seems have inspired the film character Rebecca Osborne, the “screen” daughter of Nick Sloan and Mimi Lurie, whom they placed for adoption while in hiding. The third “component” of the Mimi Lurie character, Bernardine Dohrn, could be said to have been the mother of the Weather Movement, and its most important leader. Dohrn was from Milwaukee; in the film, Nick Sloan/Redford goes there to get help in finding Mimi Lurie. Dohrn and Ayres had two children together while underground. In the film, Mimi Lurie and Nick Sloan have one daughter. After Dohrn and Ayers resurfaced in late 1980, Dohrn served 7 months in jail for contempt of court, in refusing to testify against Weatherwoman Susan Rosenberg, a participant in the Brinks robbery. This loyalty of the Weather members is one of the principal themes of the film, along with their refusal to denounce the actions of the group. Dorhn and Ayres married in 1982. In the film, Mimi Lurie is presented as coming from a wealthy Saginaw, Michigan, lumber-industry family. Their company, Linder-Lurie, owns a large swath of property on Lake Huron, on Drummond Island, where Sloan and Lurie once hid. None of the three women comprising the Mimi Lurie character were from extremely wealthy families: Oughton’s father was a bank vice president and restaurant owner, Boudin’s father was a well-to-do Manhattan attorney; and Dohrn’s family was also middle class. While any of them could have owned a lake cottage, the only truly wealthy family was Ayres’; his father, Thomas G. Ayers, was the chief executive of Commonwealth Edison, the Chicago power company. The name “Lurie” may be derived from that of the late Robert H. Lurie, a 1966 University of Michigan graduate who was partners with fellow Chicagoan Samuel Zell in a hugely lucrative real estate business. OTL,S! can find no link, at the moment, to any involvement by Zell or Lurie in the Weather Movement, and knows of no swaths of property owned by them in Michigan or Wisconsin, though either could easily have owned such land. The Zell Lurie Institute at University of Michigan is a leading innovator in entrepreneurial education. Sam Zell bought the Chicago Tribune in 2007, and his wife recently gave $50 million to the University of Michigan to support the creative writing program. Susan Sarandon, herself something of a left wing activist, plays Sharon Solarz, a housewife living in Vermont who is headed to New York to surrender to authorities when when she is arrested by the FBI. In jail, she makes a statement that she isn’t sorry, and that she’d do it all over again. This is essentially the statement made by Ayers in his 2001 memoir. Solarz says she came out of hiding out of concern for her children. This is essentially the sentiment voiced by Bernardine Dohrn as the reason she decided to resurface. The name “Sharon Solarz” may have some basis in history: Stephen Solarz was a U.S. Congressman from New York who opposed the Vietnam war. 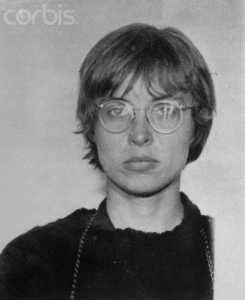 “Sharon” Naylor was one of the aliases used by Bernardine Dohrn while she was underground. Shia LeBeouf plays Ben Shepard, an employment-endangered young reporter in Albany, NY, who evolves from uncaring young jerk to wiser and less judgmental adult because of his attraction to one of the characters. Jeff Jones, another one of the Weathermen, once worked as a reporter in Albany. Jones is married to Eleanor Raskin, another ex-Weatherman. -Nick Nolte plays Donal Fitzgerald, a Milwaukee lumberyard owner who employs another old radical, and helps Nick/Jim in his search for Mimi. It may be that my hearing is poor, but Nolte’s speech seems a bit garbled and hard to understand. -Stephen Root plays Billy Cusimano, an aging hippie radical who appeals to Nick to help Sharon; this helps Ben make the connection between Nick and Sharon, and the chase begins. Kathy Boudin is adjunct professor at Columbia University. Chesa Boudin is an American lawyer, writer, and lecturer specializing in the U.S. criminal justice system and Latin American policy. Susan Rosenberg’s 58 year sentence was commuted by President Bill Clinton in January 2001. She is communications director at American Jewish World Service. Bill Ayres is a retired professor in the College of Education at the University of Illinois at Chicago; his brother John, also an expert in education, recently left a position with the Carnegie Foundation at Stanford to take a position at Tulane University. Eleanor Raskin is the wife of Jeff Jones, and is an administrative law judge at the New York State Public Service Commission. Mark Rudd taught math at a junior college in New Mexico and is now retired and living in Albuquerque. Matthew Landy Steen was sentenced to ten years on prison; after release he resumed community activism in Isla Vista, CA; Steen initiated a seminal low-income solar energy program in the County that was replicated by Community Action Programs throughout the State; for this he was elected vice-president of the Association of Southern California Energy Programs. He ran the homeless shelter in Santa Barbara; later appointed by Governor Brown as a founding member of State of California Residential Conservation Services Advisory Council. He later attended UC Berkeley. He suffered brain damage in 1992 from a severe beating at his home. It has been speculated that the culprits were ex-FBI agents at his Wall Street firm who learned of his Weatherman involvement. Currently involved with low-income housing, harm reduction and anti-poverty issues in San Francisco, California. David Gilbert, father of Chesa Boudin, is serving a life sentence in Attica. I’m looking forward to the day that these people and their families will be targeted in the same way that they targeted others. Now that’s justice. Armed robbery/murder yes, not so sure about whether, otherwise, these people were targeting others. And as far as their families, I can’t abide that sentiment, that their families should be targeted. That’s just fucked up. Andy, I think you need to actually read about the Weatherman Underground Organization. They didn’t target people. They planted bombs at government buildings and then called in warnings so that everyone would be evacuated in good time. Nobody was harmed in their bombings. It was only after the group was finished, that three old-timers did a security truck heist as part of a DIFFERENT organization called the May 19th Communist Organization. Get your information straight before you start making crazy statements and threatening to kill people’s family members. You sound like a psycho. And try to get some historical context. The actions of the Weathermen was to protest at the mass slaughter of soldiers and civilians in Vietnam, Laos and Cambodia by the US government. Roughly speaking, around 4 MILLION CIVILIANS WERE KILLED in Vietnam during that war. This is what the Weathermen were protesting against and trying to stop. I think the facts speak for themselves, Andy. The objectives of the Weather Underground were admirable, yet they failed to convince others in sufficient numbers, and turned more violent out of frustration. Some of their tactics were wrong, and counter productive, but David is correct. The scale of the destruction they caused is miniscule compared to that caused by warmongers, then and now, still trying to hide behind patriotism, anti communism, religion, and racism. It was a long time ago and those people felt that what they saw happening in the country was beyond redemption without some grand outward shows of protest…nothing else was making any impression on the people we elected to office. Sadly, people were killed that was not suppose to happen. sadly, street protests only strengthen the hand of the kleptocracy/fascists. The alternative to street protests that raise the profile of #blacklivesmatter?? Or other issues of social justice?? Protest is a constitutionally-sanctioned form of redressing grievances via assembly, petition and free and open exchange of ideas. Sometimes you have to grab the system by the collar to gain attention. We struggle to find the most effective means of political expression and change. Unfortunately, street protests pit those with legitimate concerns against the pawns of fascism, not against its makers/leaders. Hangers-on use protests as cover for irresponsible acts like looting. Increasingly the pawns/police become committed to the idea that “America” is threatened by protesters. Are organization and education better alternatives? When much of the community organization and education is already under the control of conservative forces? The human mind is subject to rather base, elementary and repetitive messages, unfortunately. I have no answers other than to suggest that protests provide an outlet for frustration rather than an effective means for change.